The squirrel went up and up and up. I thought; where is he going? I look up and close to the top of the tree is a nest. He was building a nest. That cute black squirrel was going up and down that tall tree to build a nest. By the time he had brought several items up from different places around he came down walked over to a porch nearby and just collapsed. I had to run in my house to get the camera. I came out and tried to get a picture of this black squirrel laying flat on a cement porch with all four legs lying out flat and just staring at me. I thought this squirrel was so precious. It was sad that other people were out walking down the street, weeding their gardens, or just talking in their drive ways and no one else noticed the squirrel. Two days later there were a few baby squirrels walking around. I guess he had to make the nest bigger since the babies were growing. If you stop and just BE in the moment you can see just how wonderful the world is around you. To see and love the precious beings alive just like you and I. 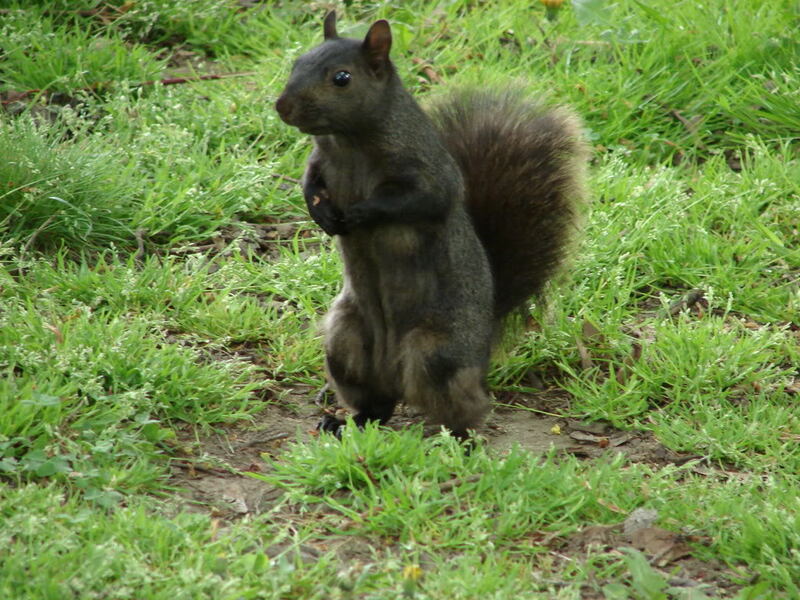 That moment in time for me opened my heart a little bit wider that day, and I often think of the black squirrel working so hard for his family. Note: Unfortunately that day my batteries died in my camera so I didn’t get any pictures.